When it comes to protecting your home from the elements of nature – wind, snow, rain and heat – a quality roof is your home’s first line of defense. When a Minnesota hailstorm hits, you want to know you have the best quality workmanship from the best local roofing company in the Minneapolis – St. Paul metro area. Johnson Exteriors understands the importance of protecting both you and your property, which is why only use top quality products when we replace a roof. Description of work: Complete reroofing after a summer storm including replacement of roof boards from tree holes. You rely on a quality roof to protect you throughout the year, but you also count on it protecting your biggest investment – your home. 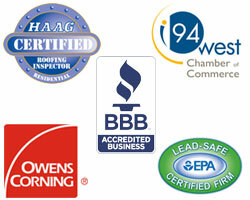 Because we take quality roofing seriously, we believe in using only the best products to replace a roof. That is why our roofing professionals prefer to use Owens Corning Shingles and products when installing your roof. 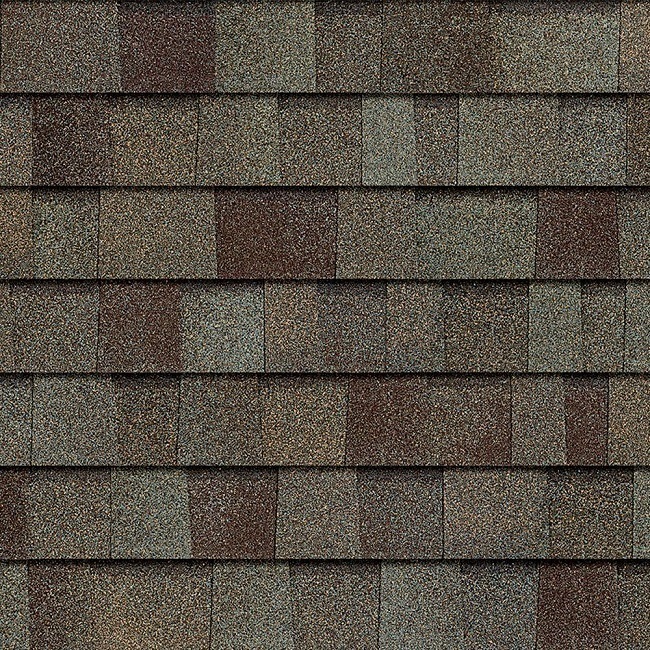 Choosing roof shingles is a decision that requires a bit of thought and research; it can be all too easy to make the wrong choice fir your home’s specific needs. In researching types of shingles, you’ll come across many choices: Should you roof your home with a 25-year, 3-tab shingle? Maybe you should invest in a lifetime laminate shingle? Years ago, Johnson Exteriors recognized the importance of installing Owens Corning Duration lifetime shingles. It is our preferred choice and should be the last roof that needs to be installed on your home (unless it is damaged by a storm). Twenty-five years sounds like a long time for a roof, but 3-tab shingles are not always the best choice because lifetime laminate shingles are built to last a lifetime and are worth the extra expense. When you call Bryan and Tracy Johnson at Johnson Exteriors, we look at your home’s specific needs and discuss what will work best to protect the integrity of your property. Besides the shingles, here are some other aspects of a professional roofing project to consider when thinking about installing a new roof and roof replacement cost. An ice and water shield is especially important during harsh Minnesota winters and the accompanying thaw that comes with warmer temperatures of spring. Simply put, it is very important in the Upper Midwest to have this shield installed. This self-sealing barrier creates proper water flow off the roof in all the eave areas of the roof. Eaves are generally the edges of the roof that serve as an overhang to a structure’s wall. A high-quality ice and water shield prevents against ice dams and keeps moisture from penetrating the inside of the house. At Johnson Exteriors, we have experience installing ice and water shields that project 6 linear feet on all the roof eaves and up all the valleys. Additionally, we install it as a safety barrier around the chimney, vents and pipes. Gutter apron and drip edge are pieces of flashing that help keep the moisture from entering the house through these areas: a gutter apron is installed on all the eave areas with a gutter attached to the fascia. The apron is nailed onto the decking, and then the ice and water shield is installed over the top of the apron. If there are no gutters currently on the house, Johnson Exteriors installs a drip edge where we would normally put the apron. The drip edge is installed on all the rakes or other edges of the roof line. We install the drip edge over the ice and water shield and the felt in these areas. Synthetic felt is a superior product when compared to the original #15 and #30 versions. Because it is so sturdy, it does not fall apart like paper felt, which is generally affected by moisture and can become brittle and disintegrate. Synthetic felt also resists tearing. 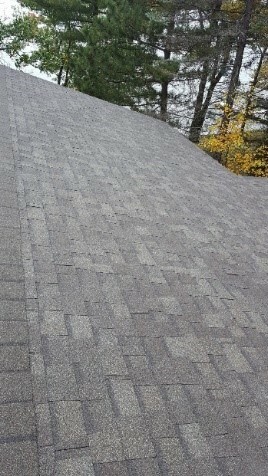 No matter how steep the roof, synthetic felt is ideal because it is not only sturdy, it doesn’t retain as much heat as paper felt; at often 30-degrees Fahrenheit cooler, it’s much easier for roofing professionals to work with, and it is sturdy enough for roofers to walk on without damaging it. The felt is installed over the rest of the open decking, wherever the ice shield and water shield is not, placed; and it is, of course, overlapped in conjunction with the ice shield. Once the felt is installed, it is time for the starter shingles to be installed on all the edges – right before the roofers start installing the lifetime shingles. Starter shingles are flat and about half the depth of an actual shingle, and they speed up installation and improve safety. All valleys must be installed in metal form. You can install a rolled valley, which is Mill in color and is used when you close the valley. This means that you only want to see the shingles in the valley area. The most common valley is an open W-valley, which is a piece of metal that looks like a W when you look straight at it. Most clients choose this style in a color that matches their shingle color. When Johnson Exteriors replaces a roof, we always check your ventilation system to make sure that it is working hand in hand with the soffit intake areas. If they are not working together in relationship with each other, that will cause problems for your new roof in the near future. We use a variety of styles of roof vents depending on the structure of each individual house. Cost is probably the number one concern of homeowners who are looking to re-roof their home. We can answer any questions you have about replacing your roof, and are happy to give you a FREE estimate for replacing your roof. If you have suffered storm damage that requires a roof replacement, look to the experts at Johnson Exteriors at (763) 355-4458 who are Minneapolis’ preferred storm damage insurance claim experts to get your roof replacement costs covered. Description of work: 1. New house and garage roof shingles due to hail/wind damage 2. New gutters due to hail/wind damage.